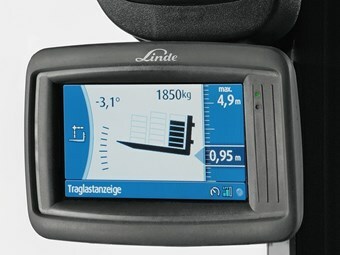 Materials handling specialist Linde has launched a new driver assistance system, the Linde Safety Pilot, to aid forklift drivers in operating their equipment safely and efficiently. The Linde Safety Pilot driver assistance system was released after years of development and testing. The system was released to the market after several years of testing and development. Linde Materials Handling Chief Technology Officer Harald Will says while electronic safety assistance systems like ESC (Electronic Stability Control) are now part of the standard equipment of many passenger vehicles, a solution of this nature cannot be applied in exactly the same format to trucks. "Appropriately adapting the solution requires special technical expertise due to greater variance between the load capacity classes, tyres, masts and load centres of gravity," he says. "This is why we are proud to offer our customers an assistance system tailored to the needs of the truck in the form of the Linde Safety Pilot system. This solution will enable our customers to operate their trucks in a much safer and more productive manner while also making forklift trucks more comfortable and easier to drive." Via a display on the driver’s workstation, the Linde Safety Pilot helps the forklift truck driver to operate the work equipment safely and helps to avoid dangerous situations, minimising the risk of an accident and improving occupational safety. The system displays critical data such as current load capacity, load centre of gravity, tilt angle of the fork arms and lift height; as well as the maximum load capacity and lift height so the operator knows to not exceed the indicated numbers. The system features a clear and concise display design so operators get all the information they need at a glance. Linde adds the system is not just an indicating instrument, but also a safety regulator in that it links to the truck’s control unit to control certain parts of the truck should an operation error occur. For example, if a forklift truck driver wishes to place a load on the shelf and is approaching the load capacity limit, the lifting speed is reduced. If the forklift truck driver continues to lift the load and reaches the maximum load capacity, the truck is deactivated and safety-critical lifting and tilting functions are disabled. The technology behind the driver assistance system relies on sensors that measure data at different points on the truck and then forward this information to the truck control unit. The Linde Safety Pilot system will initially be available for the Linde E20 to E50 electric forklift trucks with load capacities of 2.0–5.0 tonnes. During the course of this year, the system will also be available for the Linde E16 to E20 electric forklift trucks with load capacities of 1.6–2.0 tonnes. 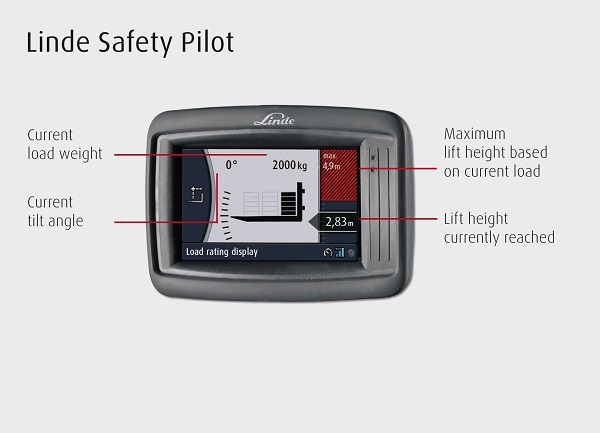 Find out more about the Linde Safety Pilot.